The characters were okay. There wasn’t much to them since the series is only 13 episodes long so there wasn’t much time set aside for each character. Toki and Kuchiha’s character, personality and past were somewhat explored but there wasn’t much about Kon. 13 episodes were too short~~ The plot didn’t even get to fully develop. In fact, I am not even clear of what the plot is myself. Puhh~ There was this one episode where Toki and co. meet the princess, Princess. In that episode, a shitload of information was given. Yeah, I had to re-watch a few times to fully process the information. All these Yakous, Nues, Teiten, Bonten, and so on just got me confused. I couldn’t sort out who the antagonist[s] were. I think it’s Teiten judging by how [spoilers from here on out] He used Yakous to drive Amatsuki to madness, I think. Those little flashbacks that Toki has once in a while were very interesting to watch. The person seems to be important to Toki but it wasn’t really given as to who the man was. It could’ve been his dad or brother but it doesn’t seem like it. Possibly a guardian. Kon. Pffft, he’s just so cool. He’s just such a shrewd person that you cannot not love him. [aha, I just used double negatives; a big no-no in grammar.] He knew something was up with Princess and had that little chat that didn’t make sense to me because it was obvious that what they were discussing, it wasn’t the right moment for the audience to know the truth. And, the mythology was enjoyable. I got to learn a few things of Japanese mythology. It was educational. Ohh yeah, can’t forget Bonten. Something about his appearance. I think it’s the piercings. >3< his personality too. I like how it was hard to discern who were the antagonists and protagonists because there was no definite line separating good and evil. I don’t know if it’s a good thing or a bad thing but each episode would end with a cliff hanger. So, I couldn’t resist watching the next episode right away. It was hard. It’s good. It’s amazing. It’s deep. It’s thought-provoking. I love it. Well, maybe not love but its more than a like. Usually, I would never watch something twice and I haven’t either but if I were to re-watch a series, I might just pick this one. I could re-watch it and maybe understand the whole Teiten and Yakou stuff a bit better. Maybe I’ll pick up the manga to get a better understanding of the story and then re-watch the show with the knowledge that I need to fully understand the anime. 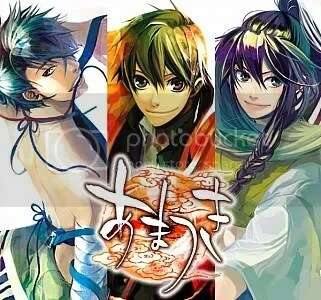 This entry was posted in Amatsuki, Anime, Finished and tagged amatsuki, anime, japanese mythology. Bookmark the permalink. Sounds somewhat interesting. But I think that all anime should be able to develop its characters within however many episodes there are. Air, for example–short as this one, but it managed to give every character the space they needed. I might add this one to my list, but I dunno yet. Lets see.. I think it was good but a bit too short. Lol, yeah.. I only watched it at first because the guys looked cool. xD but then I started liking it even more because of the storyline. Haha yes, typical way to find a good anime, check if the ppl are cool looking. one of my favorite. i suspect the short airing was because it didn’t really succeed. by seeing so many part of the story hadn’t done, well, that was the only thing that cross my mind. i haven’t read the manga version. had it complete? Tenpo Ibun is quite ok. it has similarity to Amatsuki in one or two aspects. especially a male priest dressed as woman. tenpo ibun speaks about mystical world and in this series, you can learn how a kanji was actually formed in ancient time. While originally scheduled to air for 52 episodes, the series’ length was shortened to 25 due to its low ratings and ended its run on March 31, 2007. I think i read it somewhere that the popularity was eaten by Naruto and one other title — probably Bleach. anyway, i saw AMATSUKI manga today at Kinokuniya… o.o.. Volume 12…. Lol, I agree. 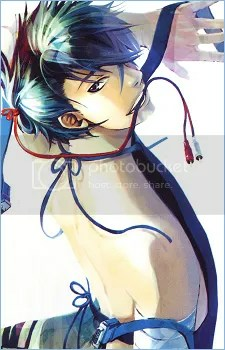 Bonten.. x] he’s so, so, so hot. ahah. Ooh, you dont like to read series that aren’t finished? wait… i thought one man in amatsuki is a priest and dressed quite like a girl. and face like a girl. but.. i learned that certain priest had to dressed like woman, like in Tenpo Ibun. not that i dislike to read unfinished series,.. but it hurts my heart to wait forever if there’s no news whether it continues or not. 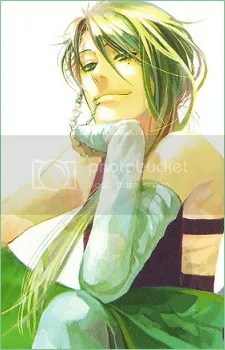 i’m a fan of Saiyuki, Saiyuki Reload, and Saiyuki Gaiden. I hate to say that i stuck reading it becoz it’s not yet continued. i even bought the original – in japanese text! another that haven’t yet finished n i bought original japanese was Peacemaker Kurogane. Ooh, okay.. I know who you’re talking about now. lol, sorry.. the character just slipped my mind. there’s this one person and she/he looks like a girl but then she/he used to be a man.. now he/she is genderless. Lol, it’s all good. My comments are pretty long too. think the priest in amatsuki is the one who has young brother.. so he’s still there and ‘genderless’…? shoot! i can’t remember the detail of the story..
lol.. uhm, yeah.. he’s tall. hmm.. that might be his siter. Lol..
Lol, you got the basics down. It was his ‘future’ Kon that they found. i guess i have to re-watch many anime i had done… including amatsuki -_-"
Lol, so then you’re probably watching Starry Sky? ahah. I like the animation, it’s really nice but I don’t know if you’ll like it or not. i even didn’t watch anything for around 5 months T_T. I started again recently. so far, i want to finish Gintama. other than that, i finished “Challanged” – a j-dorama. quite a good story. becoz i have time for that.. watching drama is actually taking more time since it’s longer duration. since my website do transcribing from anime, drama, film, n games,… right now majority is still from anime. i try to balance by watching more drama..
whaaatttt…. GINTAMA is continued????? so it’s season 4 now????? Lol, of course.. it’s all about the bishes. haha, something to look for to, right? Yeah, gintama’ is currently airing and the action just gets better and better. It just seems the comedy/jokes seem dumb at times but that’s why they’re so funny. lol, indeed. anyway, i cannot reject the bishieness of Gin, Hijikata, Zura, and the bad guy who lost his sight (in this moment i forget). and i really feel curious how the story will end.. I wonder how it'll end too. I just can't imagine what kind of ending it would have. I would love it if it never ends.